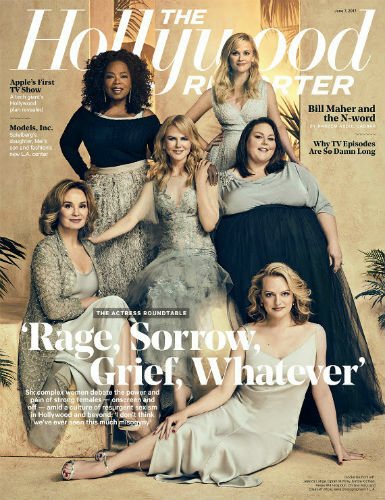 -THR’s TV Actress Roundtable this year includes Oprah, Reese Witherspoon, Nicole Kidman, Jessica Lange, Elisabeth Moss and Chrissy Metz. Once again, Reese brings up the blind item about the crappy movie that leading ladies were fighting over. When she first brought it up, everyone assumed it was Mortdecai but now A Million Ways to Die in the West is picking up steam. -Speaking of great group convos, The LA Times drama actor roundtable includes Justin Theroux, Laura Dern, Regina King and Milo Ventimiglia. –George Clooney’s dad, Nick, is spilling details about the twins. -Gilmore Girls’ Liza Weil is dating her HTGAWM costar Charlie Weber? Wayment – since when is she no longer married to the guy from Private Practice and Prison Break?! I loved them! -Even though he split from Olivia Munn, Aaron Rodgers reportedly still isn’t talking to his family. Wow, it’s almost like she wasn’t to blame for the estrangement in the first place. Imagine that. -Just in case you needed more proof that Gal Gadot is awesome, she was pregnant while filming Wonder Woman. -Also, it’s crazy that Patty Jenkins has NO deal for a Wonder Woman sequel yet. -The National Enquirer era of Us Weekly has started. This Ivanka-positive cover is a mess. US is now owned by a Trump confidant and member of his Health Advisory Board. –Alexis Bledel and director Reed Morano break down how they created the most haunting scene from The Handmaid’s Tale. -The latest Actors on Actors features Michelle Pfeiffer and Sarah Jessica Parker interviewing each other. If you don’t want to watch the whole episode, here are clips of SJP talking about SATC, and her trying to convince Pfeiffer that Into the Night is a good movie. -Meanwhile, it’s SATC’s 20th anniversary, which reminds me of my favourite article on its legacy and why it deserves more praise. -A deaf woman sang on America’s Got Talent and made the whole country cry at once. -Vulture has a joint conversation with Ann Dowd and Margo Martindale and now I just want them to star in a buddy movie. -This is charming: Prince Harry reunited with a 97-year-old fan in the pouring rain. -Crazy Ex-Girlfriend’s Rachel Bloom says she doesn’t want to campaign for the Emmys — in this music video about campaigning for the Emmys. –Felicity Jones debuted her engagement ring on the red carpet. -Here’s our first look at Emily Blunt and Meryl Streep in Mary Poppins Returns. -This is a great deep dive look into The Joy Luck Club and how that movie almost didn’t get made. –Nicole Kidman is a hockey fan? I did NOT see that coming. -Also, on James Corden last night Nicole tried to pressure Kit Harington to propose to his girlfriend and Game of Thrones costar Rose Leslie. –Ed Sheeran joined James Corden for an acoustic Carpool Karaoke last night. I tried really hard to watch it but 13+ minutes of Ed Sheeran was beyond my capabilities today.